There are several series which I have started on this blog and not continued/finished. So I thought I'd pick them up again. 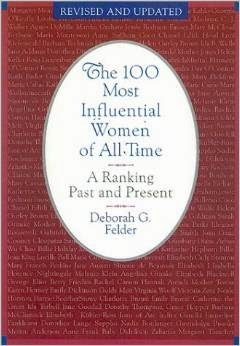 I particularly enjoyed writing about the women listed in Deborah Felder's book: The 100 Most Influential Women of All Time. Felder wrote about them in the order that she had ranked them, but I chose to write about them chronologically, in hopes of fitting them more closely in my mind with the time in which they lived. I'll have to go back and re-read my posts about the earlier women. I see I last wrote about George Eliot who lived from 1818-1890. The next person listed is Queen Victoria (1819-1901), ranked 38 out of 100. I must admit I'm not much of a fan and I'd need to go back and re-read the library book to remember why Felder gave her that much credence. Though I'm certainly no expert, the only real way in which I would consider her influential is that she and her husband Albert changed the pattern of behaviour for British monarchs. They both had unhappy childhoods which they attributed to the sexual escapades and affairs of their parents; they decided to be more upstanding, to practice higher morals and to raise their children to behave similarly. I'm not sure the latter attempt was successful, considering the life of their eldest son, Bertie. Nevertheless the Victorian era became synonymous with rigid social rules about sexual morals, such that even when discussing furniture one said 'limbs' rather than 'legs'. The Victorian era is also remembered as one of hypocrisy (hence the name, Victoria's Secret for the lingerie company), because of the levels of poverty that led to prostitution, the widespread use of child labour, also the strictest observance of the class system. Between the 'family values' they upheld and the size of the family they produced (nine children) Victoria and Albert personified a lifestyle with which the growing middle classes of Britain could identify. Just before Victoria came to power in 1837, Britain had passed the Slavery Abolition Act in 1833 which outlawed slavery in the British Empire (with a few exceptions). In 1838 £20 million pounds was put aside to pay to slave owners as reparation for the loss of their slaves; of course no reparation was offered to the slaves themselves. Nothing I've read about Victoria suggests she was a particularly fond mother. She thought babies were disgusting. Later, she saw her children as obliged to serve and please her and seems to have had little regard for their feelings. Whether this was because of her view of being a mother or of being a queen, I'm not sure. I gather this was not an uncommon attitude in Victorian society overall, particularly where advantageous marriages were concerned. According to Wikipedia Victoria supported the Reform Act of 1867, before which only 14% of the seven million men in Britain could vote. This act doubled that number. However, Victoria was not in support of women being able to vote. "...these commanding premises...be let or sold in consequence of the late occupant's declining business." She was known to be susceptible to flattery and apparently had the odd crush on various men, earning her the nicknames of "Mrs Melbourne" and "Mrs Brown". Queen Elizabeth I also had affairs of the heart, or at least one with Robert Dudley, but as queen before the institution of constitutional monarchies she had a great deal more power and during Elizabeth I's reign England became a great power. The Great Famine in Ireland happened during Victoria's reign, when Britain was at its peak, the richest nation in the world. For some time I've held her largely responsible in my own mind. However, just now I've read that she gave £2,000 toward the British Relief Association in aid of the Irish, more than any other individual. I've long thought of her as full of self-pity, a spoiled and pampered individual who happened to be born into the royal family. That said, she had a horrible childhood living under the Kensington System, an elaborate set of rule devised by her mother and her mother's supposed lover to keep Victoria weak and dependent. She clearly adored her husband, though she was loathe to lose any of her power to him. I can't imagine that being royalty, particularly being the longest reigning monarch in Britain's history is conducive to having what I would consider to be an admirable character. 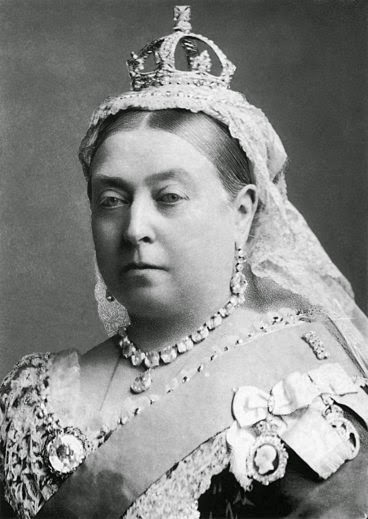 The 'constitutional monarchy' had been in place for well over a century by the time Victoria became Queen, so her powers were quite limited, perhaps only to "the right to be consulted, the right to encourage, and the right to warn". So perhaps I'm too hard on the woman. In any case her name describes the era in which developed societies became industrialized and she perhaps witnessed the largest changes in the world during her reign, the longest in British history to date. By the way, mark your calenders. This year 11 September will not only be the 14th anniversary of the attack on the World Trade Center and the Pentagon, it will the be day on which Elizabeth II takes the place of Queen Victoria as the longest reigning monarch. I'm wondering what sort of events will mark the observance of that event! You always come up with the most fascinating topics. I must admit that what little I know about Queen Victoria is a matter of the movies I've seen - clearly not depicting historical reality other than, perhaps, the number of her children and a handful of other facts. Indeed, you point out many contradictions during the long period of her reign, and many consequences - intended or otherwise. Naturally, when Hollywood puts a pretty face like Emily Blount to the name/story - I believe that's who played Victoria a few years back - we are more favorably inclined to whatever the script portrays as reality. That, of course, is a good reason to remember that screenplays produce fictionalized stories; books may be more likely to present fact and context.